Learn it from Manmohan Singh,Mr Kejriwal? 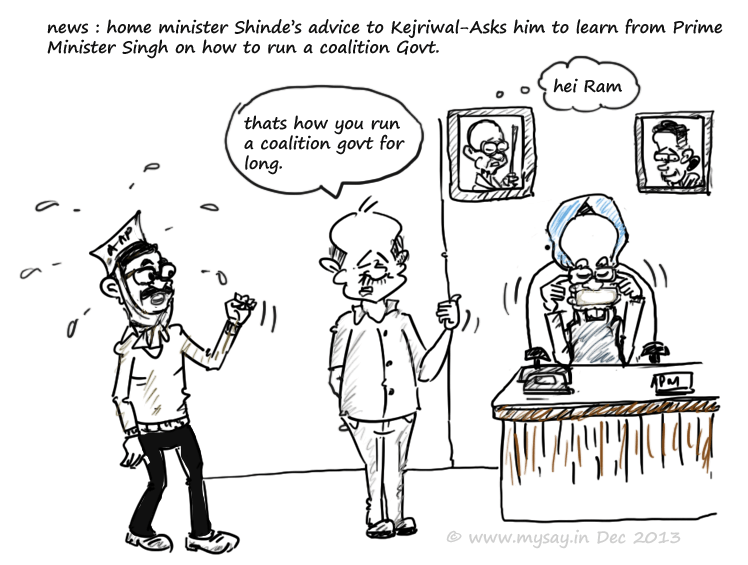 Union Home Minister Sushil Kumar Shinde gave an advice for Arvind Kejriwal , the new Chief Minister of Delhi,on how to run a coalition government.He sited example of Prime Minister Manmohan Singh on the matter and asked Kejriwal to learn from Dr Singh how to run a government in coalition.The Congress has given support to AAP with its eight seats from outside to help run AAP’s government in Delhi.Although AAP is supported by Congress ,it is not refraining from making statements against Congress and BJP. How to stay quiet in all Indian languages? Lovely doodle 🙂 and nice template, long time no see Jack ?